Others wonder if anything at all will occur—remember Y2K? *Will cosmic and earthly chaos disrupt our lives with destructive sunspot cycles, volcanic super-eruptions, monster storms, mass extinctions, and asteroid threats? *Will huge leaps in technology create bionic humans, computers that think, and an end to all disease—possibly even death itself? *Will economic and geopolitical powers shift out of the West and into the "the New Eurasia," with new wars being fought over dwindling resources as global warming takes its toll? *Will this be the evolution revolution of human consciousness—or the final countdown that leads to Armageddon itself? 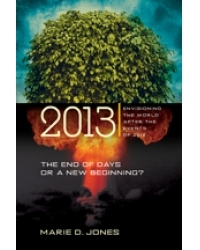 *Will it be the apocalypse so many have feared—or the rebirth of the world and the transformation of humanity? Marie D. Jones is the coauthor of Supervolcano: The Catastrophic Event That Changed the Course of Human History and PSIence: How New Discoveries in Quantum Physics and New Science May Explain the Existence of Paranormal Phenomena. She is a widely published writer with hundreds of credits, including dozens of inspirational gift books and five Chicken Soup for the Soul books. She is also a licensed New Thought Minister and spiritual counselor with a background in metaphysical studies. She has appeared on numerous radio shows including Coast to Coast A.M.